Today in plans nobody thought all the way through, we have Created Equal, an anti-abortion group based out of Ohio who really wanted to display graphic images of abortion procedures somewhere near the Alamo. For reasons that remain, frankly, a little opaque to us, the group decided to partner up with a local San Antonio ministry called Love of Truth and set up a Jumbotron on the Alamo grounds. The plan was to display videos of abortion procedures on a loop for hours, presumably for the families of tourists who make up most of the Alamo's visitors. But the city of San Antonio has decided to shut that whole thing down, telling the anti-abortioneers that while they're free to hand out pamphlets, there will be no Jumbotron videos. 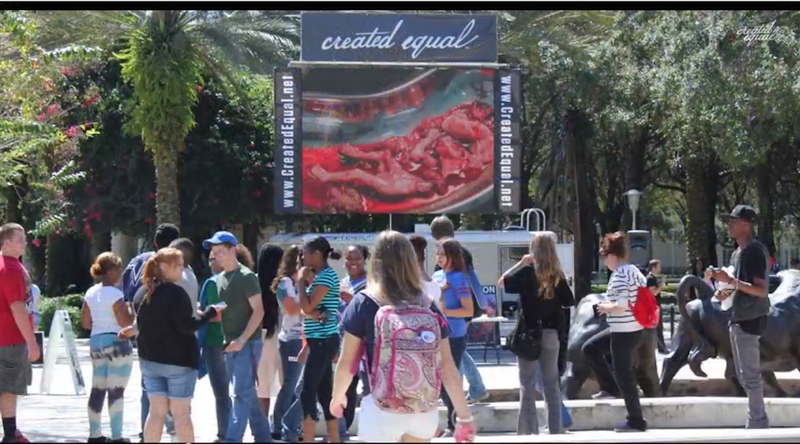 The Jumbotron is Created Equal's favorite tactic; if you're wondering what it looks like, here's a 2013 video of them taking the show to University of South Florida, with shots of purported abortion procedures interspersed with chestnuts like "abortion is ageism." The idea here seems to be that showing supposed abortion procedures will show how awful abortion is (although showing, say, appendectomies would probably be just as unappealing, and nobody, that we know of, is calling for a ban on those). Created Equal also leads what they have termed "justice rides" made up of college students. On their website, they show another video of an abortion procedure, this time interspersed with images of Martin Luther King delivering his "I Have a Dream Speech." Mark Harrington, the executive director of Created Equal, cheerily told the San Antonio Express-News that the images would be graphic, and that anybody planning to walk by the area with their children between the hours of 11 am and 3 pm would probably need to find a different way to walk. "It's not something we choose to do," he added. "And frankly I would be willing to stop showing the photos if the killings would stop. If it saves one life here at this campus or at The Alamo, then it is worth exposing this, or maybe offending some people's feelings." On Wednesday morning, though, San Antonio city officials decided the Jumbotron wouldn't be allowed. While Created Equal got a permit to demonstrate on the Alamo grounds, the video display would have violated "prohibiting the use of digital signs on historic city property," according to the Express-News. But Created Equal tweeted that they planned to set up anyway and "see if reasonable heads prevail." Sounds like that's just what happened, come to think of it.